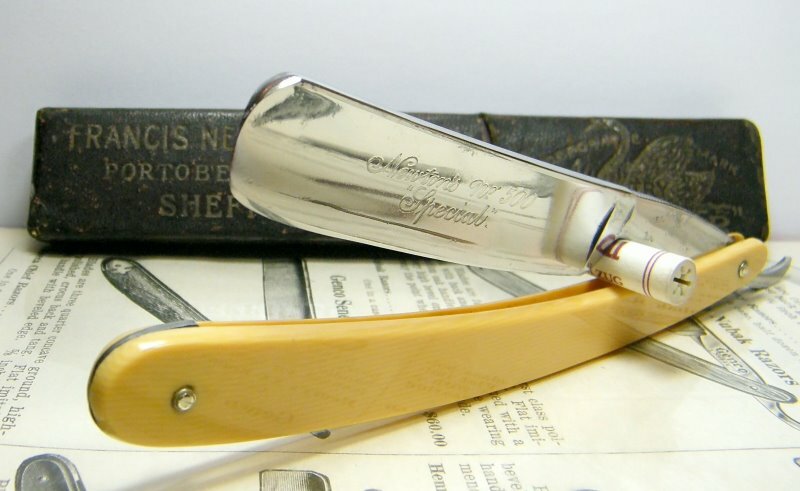 STRAZORS.com - all about classic razors - Francis Newton & Sons, Sheffield. Francis Newton & Sons, Sheffield. Francis Newton traded under his own name after about 1837, manufacturing table cutlery, pen and pocket knives, razors and various tools. By the start of the 1850s, Francis had brought his sons - Thomas Newton (c.1825-1892), Francis Newton Jun. (c.1828-1904), and James Greaves Newton (1831-1878) - into the enterprise. In 1884, Newton's took over the assets of the bankrupt steel, tool, and cutlery business of Joseph & Robert Dodge. The firm's products were impressed with the corporate marks, "Premier", the figure of a swan with the word "Try", and "Juste Judicato" (Dodge's old mark). A silver mark was registered in Sheffield in 1906, when the company adopted limited liability. Newton's sold to the home market and the Continent, particularly to Dutch and German customers. In the 20th century, Newton's marks were bought by George Butler. The Newton name survived and was still listed in directories at the end of the 1980s.